Here are a few suggestions to show your appreciation next time you get that special invitation. The Manuka Honey Tea Set. Manuka Honey is always special, particularly if you add it to your tea. A combination of fancy teas and a jar of Manuka Honey is a great gift. After a big party, the tired host will appreciate a relaxing beverage to finish off the day. I usually like to package the gift and make it look extra special. The Oriental Trading Company offers nice gift boxes like this box example. 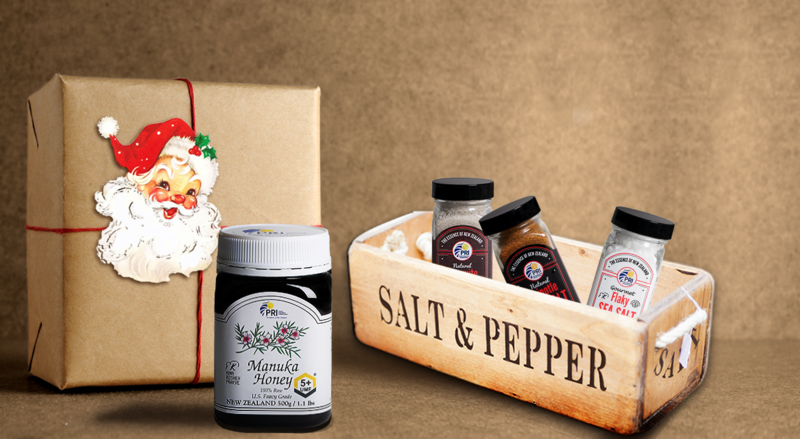 Pacific Resources International has a collection of Flavored Pacific Sea Salts that can really kick up a dinner. This power salt trio can delight that chef in your family – Chipotle, Mesquite, Flaky! Wrap it up in an unfinished wood box and surround the salts with tissue. Would love to hear from you and have you share your gift ideas.